In fact, few have done more than me to tear the golf courses of this country into little pieces. Yes, I play poorly. But I try. If you are not a golfer, forgive me this indulgence. I report every week about what I've been eating, and I always like to do something a little unusual. First, here's a look at my favorite 9-hole course, Golf Hostivař. I think it is the best-kept of the ones I usually play. It was 800 CZK to tee off on a weekend. 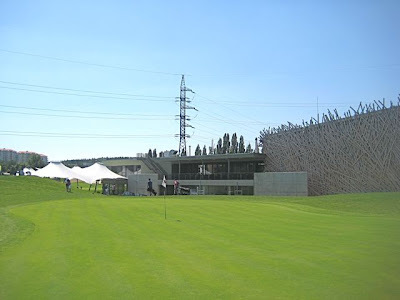 There is a modern club house building. 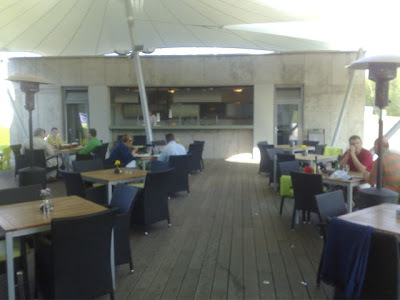 And in the back is a restaurant with a pleasant outdoor patio. There are sheep grazing nearby. For the human grazers, the menu was relatively ambitious and on the upscale side. I was happy to see they had a lava grill outside. 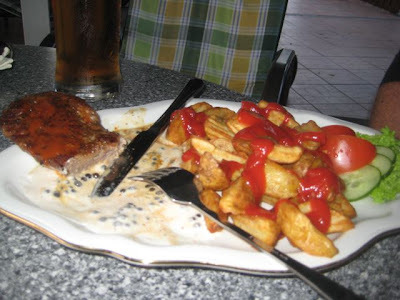 I decided to splurge and ordered the rib eye steak (350 CZK). 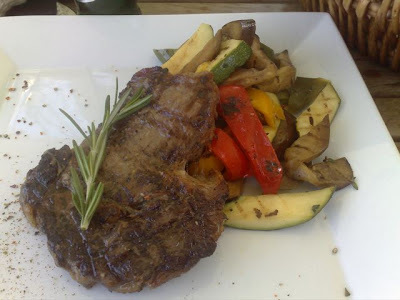 It came with grilled vegetables marinated in balsamic vinegar and olive oil. It looked pretty, but this was a pretty big disappointment. A rib eye should be the tenderest of cuts. But this one was very tough and overcooked. There was a good smoky flavor from the grill, but it was tiresome to eat it. The veggies were well prepared, still with some crunch. 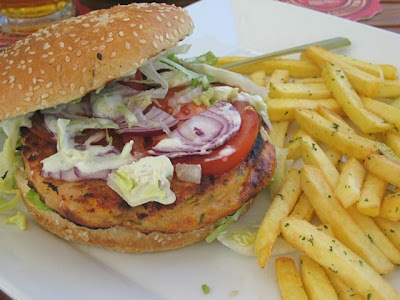 On a later visit, I went for the Thai chicken breast burger (195 CZK). There was wasabi mayo, lettuce, tomato, red onion, and fries on the side. A quality bun. This was much better, among the best chicken sandwiches I've had in Prague. It was not whole breast, but a re-formed patty. Still, it held together well, had a great char from the grill, and was well-seasoned. I could taste the wasabi in the mayo. Fries were fine -- thick and fried crispy. 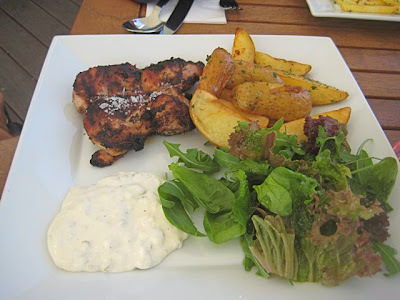 Michigan Man had a grilled chicken thigh with American potatoes and a small salad. He said it was very good, but I didn't taste it myself. They serve Pilsner Urquell on draft (40 CZK/Half-Liter). It did taste mighty fine after a game. They don't offer Gambrinus, but do have non-alcoholic beer. 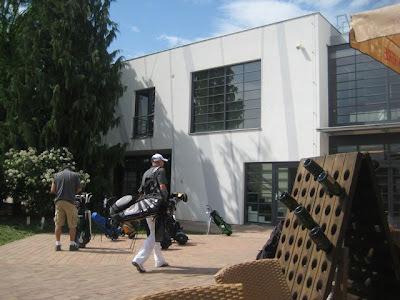 Another course I've played on a number of times is at Golf & Country Club Hodkovičky. It's down along the Vltava River, south of the city center. This 9-holer is not as well kept and is also 800 CZK on a weekend. One problem for me: there is always a concern about killing a roller blader or cyclist on the popular paved paths that run along the fairways. I've only had one thing from the restaurant, but it is something I can recommend. 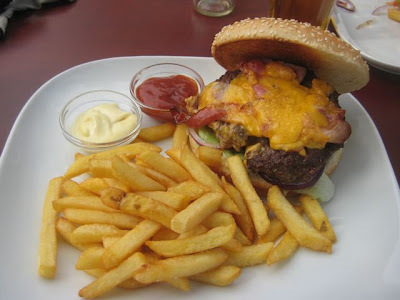 They do a fine bacon cheeseburger (235 CZK). It's not flame-grilled as far as I can tell, but the large patty was made with top-quality beef. There was a big, strong bun. It had all the fixin's -- lettuce, tomato, red onion, smoky bacon, cheddar cheese. It all fit together. Not cheap, but neither is golf. In this context, it was worth it. I'd get it again. The fries were excellent. I'd just criticize them for being stingy with the little dish of ketchup. I had to ask for extra to put on both my burger and fries. 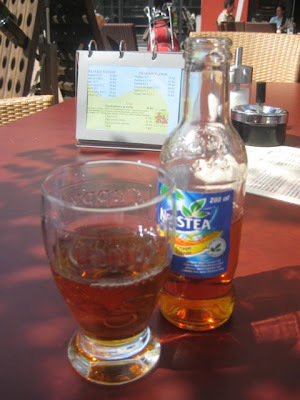 And I was not happy with the tiny .2 liter baby bottle of Nestea that they served (39 CZK). It hardly quenched my thirst, and the price was crazy. I ended up going over to a nearby vending machine, buying a half-liter ice tea bottle for cheaper and refilling my glass with it. 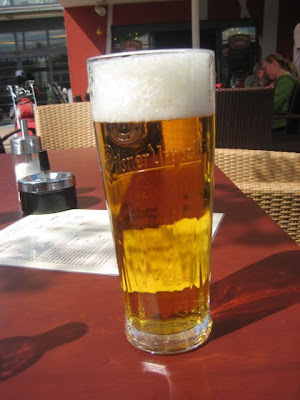 They also offer a half-liter of Pilsner Urquell for 45 CZK. Unfortunately, I could not partake in that more economical and satisfying beverage since I was driving. 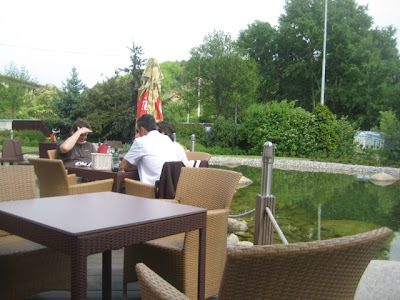 Golf Resort Beřovice is the furthest from the center of Prague, about an hour drive. And it is also the most hilly. The weather was mixed, but we did get a nice rainbow show. 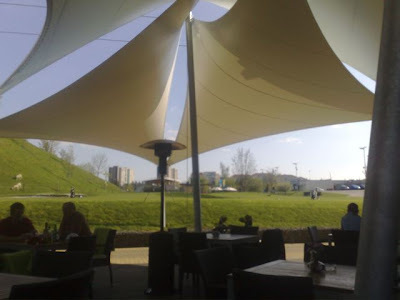 We played 18 holes (1400 CZK on a weekend), and we were pretty exhausted by the time we hit the Birdie Restaurant. I was too tired and forgot to take a picture of the dining area or the food before we started eating. We sat outside, but you can see how the inside looks on their website. 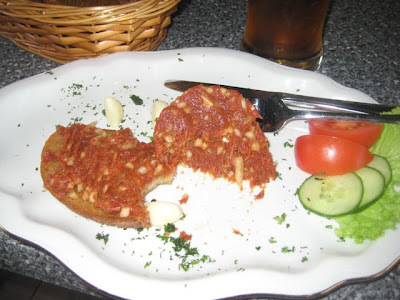 I had steak tartare. They allow you to season it yourself if you want, but I let them do it. And they did a good job. The beef was top-notch, very garlicky, with the right amount of onions, salt, and the rest. I rubbed young, fresh garlic on the topinky, the oil-fried Czech bread, and it was extremely sharp. I passed some around and my friends enjoyed it. 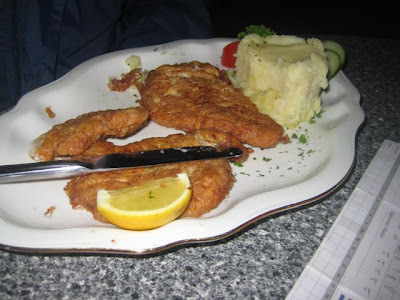 Michigan Man had the pork schnitzel with mashed potatoes. I had a bite, and it was pretty greasy. But they used good pork, and it looked quite filling. J had steak in a pepper cream sauce with American potatoes. The beef looked overcooked to me, but he said he enjoyed it and was glad he ordered it. 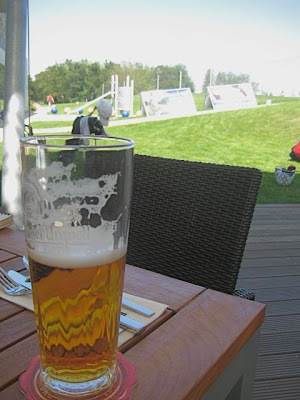 All in all, the food to be found on the Czech golf courses I've played was better than I expected. And thinking about their food helped me take my mind off my game, which is singularly ill-designed for getting that damn little ball in the hole. 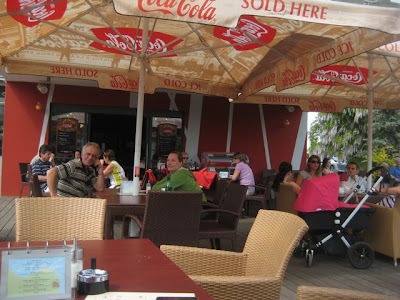 it hit my eye that there are coca-cola umbrellas in the expensive golf restaurant? I don't understand any restaurant except poor village beer pubs why they take it. I guess it is free but then you can forget any effort on uniqueness, atmosphere etc. 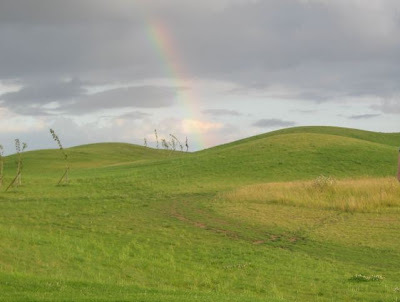 Have you tried the course near Bechyne? The clubhouse is in an old hunting lodge. I've eaten there, but I wouldn't comment on the food because it was 5 years ago. We still go to Bechyne every year though. Drive south to Tabor then West 20 minutes to Bechyne. Haven't been there, but good to know. Food their seems really nice. I think you have enjoyed food more rather than golf.